It’s hard to keep track of all the moving pieces and details of owning, registering, and maintaining a domain name. 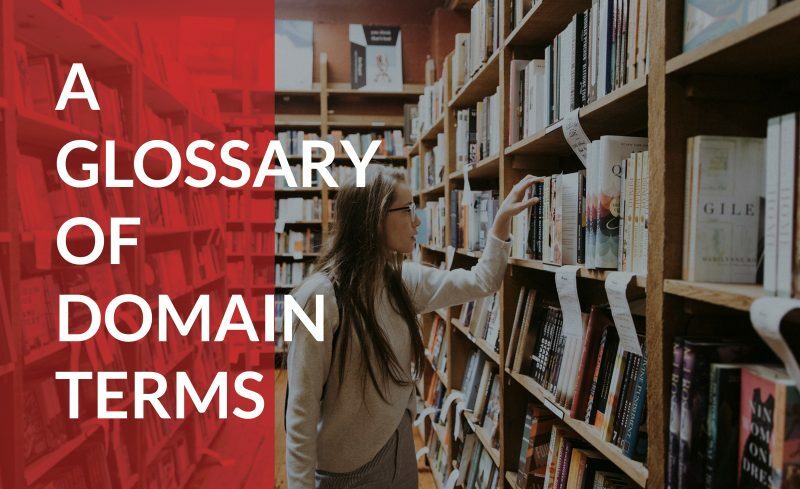 Since the right domain name is essential to getting your business online and spreading your brand around the world, we’ve created this Glossary of Domain Terms to kickstart your understanding of everything domain names. If you want to learn more about owning, registering and maintaining a domain name, check out our starter guide, Everything You Need to Know About Domain Names, and start finding a home for your business online. A Record – This setting is used to point a domain name to a specific IP address. Country Code Top-Level Domain (ccTLD) – These are two-letter domain names that are associated with a specific country, such as .US for the United States or .CA for Canada. Cybersquatting – The process of registering a domain with the intent of preventing someone else from doing it, in the hopes to block them, steal traffic, or sell the domain to the other party at an inflated price. Domain Name – The name of your website, which follows the ‘www.’ in the URL, and also what follows the @ symbol in an email address. For example, in ‘www.Domain.com’ the ‘Domain.com’ is the actual domain name. Domain Name System (DNS) – The system that translates the numbers of an IP address into an easy-to-read domain name. Domain Flipping – The process of buying a domain name and selling it quickly for a profit. Domain Privacy – A feature often provided by domain registrars that hides the domain name owner information from the search results of a WHOIS inquiry. Generic Top-Level Domain (gTLD) – The most common domain names, such as .COM, or .NET. Grace Period – The period after a domain name registration expires, but can still be renewed by the registrant, and before the domain is offered up for general sale. Internet Protocol (IP) Address – The string of unique numbers used to label a specific computer or computer server, which can then be renamed into a domain name. International Corporation for Assigned Names and Numbers (ICANN) – The organization that coordinates the Internet’s naming system and regulates the domain industry. Misspelled Domain Name – Purchasing different, even incorrect spellings, of a domain name ensures that the audience looking for your business or brand online find your website, even if they type in your domain name with a few errors. New Top-Level Domain (nTLD) – TLD stands for “Top-Level Domain” and the “n” stands for “new.” A TLD is a string of characters that follow your domain name. For example, in the domain “myawesomedomain.com” the TLD, or domain extension, is .COM. nTLDs are newer to the market, and include extensions such as .club, .design, and .news. Nameserver – A web server that stands in as a resource directory, sometimes for another server. Parking – The process of pointing a domain name to a page that is acting as a placeholder, used either as a space to advertise the sale of the domain or as a standby page before the owner starts using the domain name. Premium Domain – A high-value domain name that has been previously registered, often because they contain valuable SEO keywords. Premium domain names have a stronger branding potential, are often easy to remember, and attract more website traffic than standard domain names. Redirect – If a domain name is no longer being used, but is still registered, an owner can push any incoming traffic to a new, connected domain name instead. Redemption Period – After a domain name registration expires, and after the grace period, when the previous owner can still renew the domain, but usually at a higher price. Registrant – The owner of a domain name, or corporation in control of the registration of the domain, either of which is listed on the domain name’s name record. Registrar – An accredited business or organization who sells domain registration services to the public. Registry – The overriding organization that maintains and controls top-level domains (TLDs), who most often work with a registrar to provide domains to the public, rather than directly. Reseller – An individual agent or affiliate of a specific registrar who sells domain name services. Reverse Domain Hijacking – The process of trying to obtain a legitimately owned domain by using false claims to contest ownership. Search Engine Optimization (SEO) – The practice of tweaking and optimizing your website settings, or the content on a page to increase exposure to search engine robot crawls with the intent of appearing higher on the search engine results page. Second-Level Domain (2LD) – A domain name that is located below another domain name, for example, .com.us, with the .com being the second-level to the .US domain name. Subdomain – A separate address located under a domain name, such as store.brand.com. Top-Level Domain (TLD) – The last segment of a domain name, or the part that comes after the dot. Examples are .com, .net, .org, and .club. Transfer – Moving a domain name from one registrar to another without giving up ownership. Universal Resource Locator (URL) – This is the string of numbers and symbols located in the address bar at the top of your web browser, which includes all of the information your computer needs to find the right page, image, or document on a website. WHOIS – A system that makes it possible to search the owner information of a registered domain name, as well as other details such as contact information. Want to learn more? Our starter guide, Everything You Need to Know About Domain Names, helps you start finding a home for your business online. Quote: Domain.com has over 300 domain extensions to choose from to help set your website apart from the rest. It all starts with a great domain.